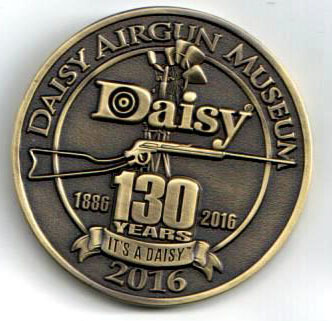 2016 Daisy Museum Collectible Medallion. This year's coin medallion celebrates Daisy's 130th Anniversary. It shows the iconic Plymouth Iron Windmill in the background and the Daisy 1st Model Wirestock BB gun in the front. These medallions have been collected ever since the Daisy Airgun Museum first opened in 2000. Start your collection today.